I love eating any flaky kind of pastry. And of course, I wouldn't resist eating any flaky kind of mooncakes. After satisfying my son with mini baked custard mooncakes, I like to satisfy myself by baking my favourite thousand layer flaky yam mooncake (also known as 千层芋泥月饼 in Chinese). 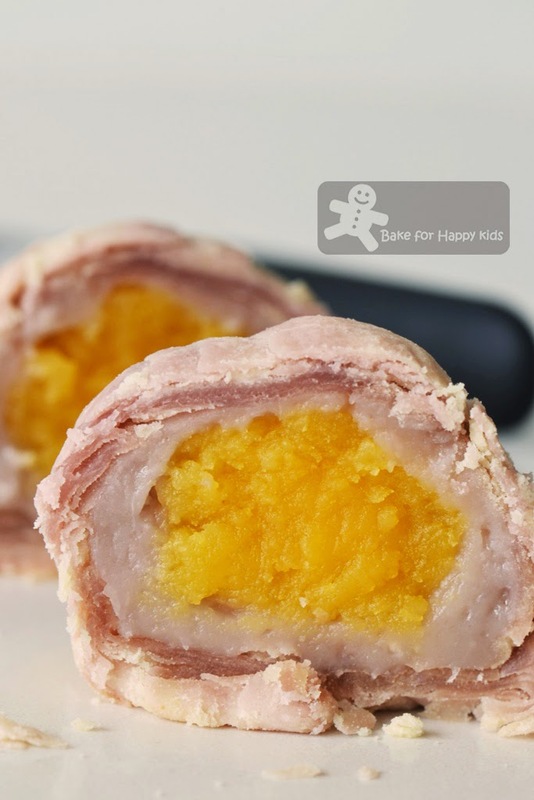 Learning from I have made previously at here, I have used the similar custard filling with three egg yolks to substitute the use of twelves salted yolk in my yam mooncakes. I'm so proud of myself that I have this brilliant idea... LOL! As I can be very fussy with the quality and nutritional content of the food that I eat, I like to bake something that is not overly rich and not overly sweet and yet something still smooth and delicious to indulge. Balance! Balance! - This is what I usually tell myself. I have used the most sensible amount of sugar and oil to bake these mooncakes and not forgetting that I have promised myself not to compromise their taste and texture. No hassle of getting rid the tough skin of yam! I'm using the frozen ones from Asian grocery. Use a skewer or fork to test if the yam is cooked. If it is soft enough, it is! Process yam when it is hot as cooled yam tends to be firmer and you might fry your processor! This is always my son's fav! The addition of colouring is optional but the contrasting colours will make the pastry looking very pretty! Shaping these are so therapeutic! These are easier to roll after chilling. 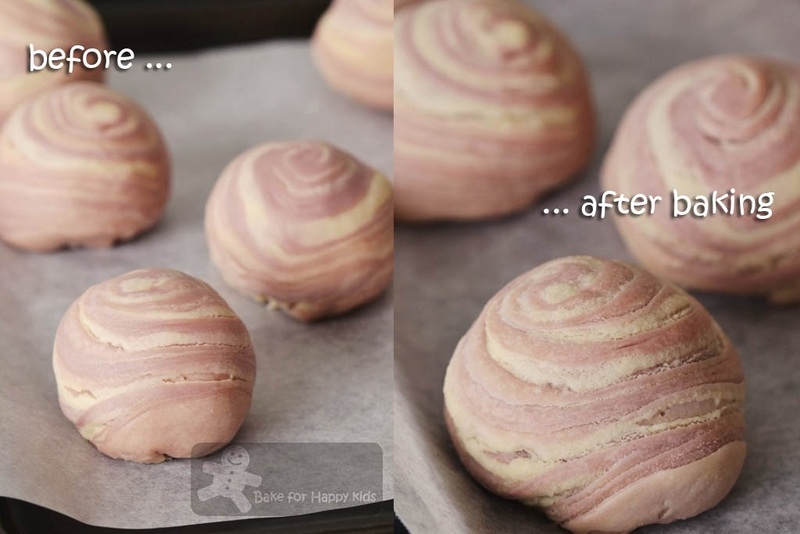 Can't see much difference before and after baking? I know that the mooncake is cooked when its pastry is firm. Can't wait to try one soon! Chilled mooncakes... They look so smooth and pretty! Besides their look, you have to trust me that these mooncakes are not overly rich and not overly sweet and being perfect in its taste and texture. We don't even have to cut each of mooncake into quarters as half of these mooncake can be easily consumed even as tea time snack in just a mouthful. My fussy husband said that he is totally impressed with these mooncakes... Are you? Here are the recipes that I used to make these mooncakes. 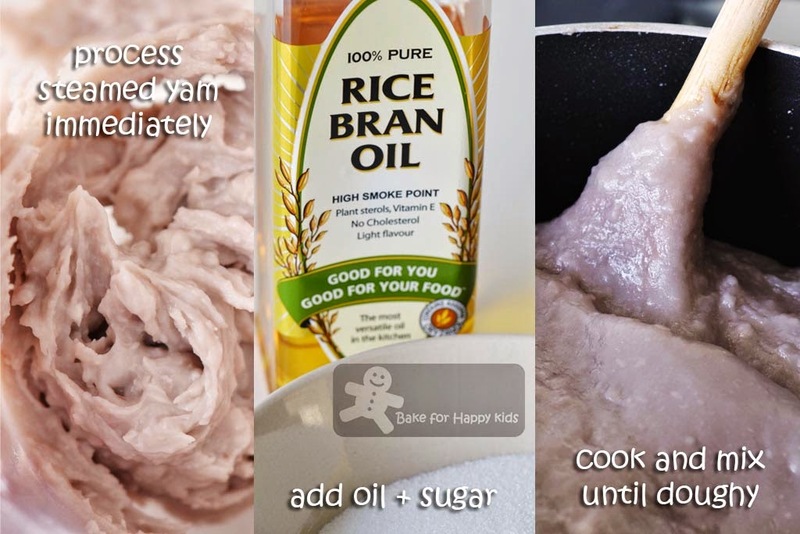 Instead of making a sweet and slightly savoury Teochew style yam filling with added shallot, I have chosen to make something plain basically just yam, sugar and oil. Here, I'm making my yam filling with a reduced amount of sugar and oil added but optimal enough to taste good and smooth. Peel skin off yam thoroughly and discard the skin. Otherwise, you may wish to use the frozen ones which have been peeled before packaging. Make sure nothing tough is left on the yam as the tough bits will affect the smoothness of the paste. Cut yam into pieces and steam until soft. To test, using a skewer or a fork to pierce the taro to see if it is soft or breaks easily. 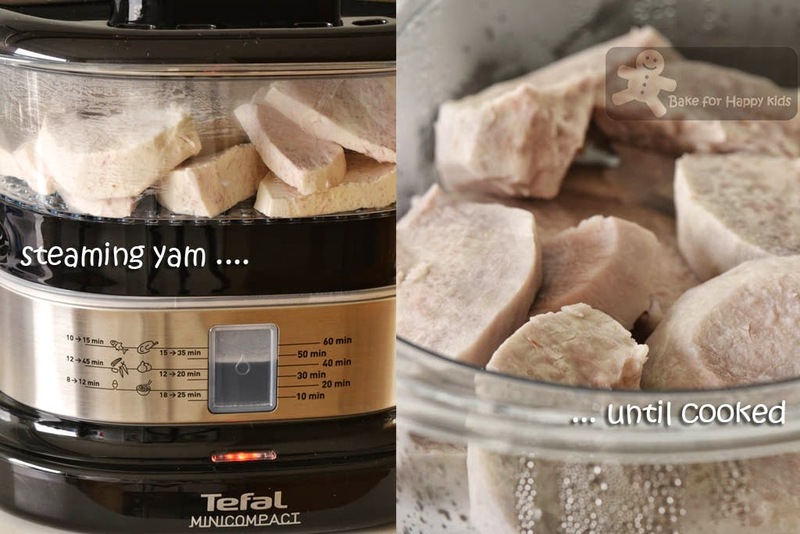 Using a processor or a blender, process the steamed and warm taro until paste-looking smooth. Warning: Cooled yam tends to be firmer and stickier to process and can potentially fry your processor! Place processed yam in a large frying pan. Add sugar and vegetable oil and cook mixture with medium low heat. Keep stirring and cook the mixture for about 15-20 mins or until mixture forms a dough. Turn off the heat. Set aside. Allow the mixture to cool completely. Chill mixture thoroughly in the fridge before using it as mooncake fillings subsequently. Using a wooden spoon, beat butter and sugar until light and combined. While beating, add egg yolks one at a time and beat until combined. Beat in condensed milk, cream (and coconut milk, optional). Sift flour mixture into the egg yolk mixture and mix until combined. Knead mixture until smooth. 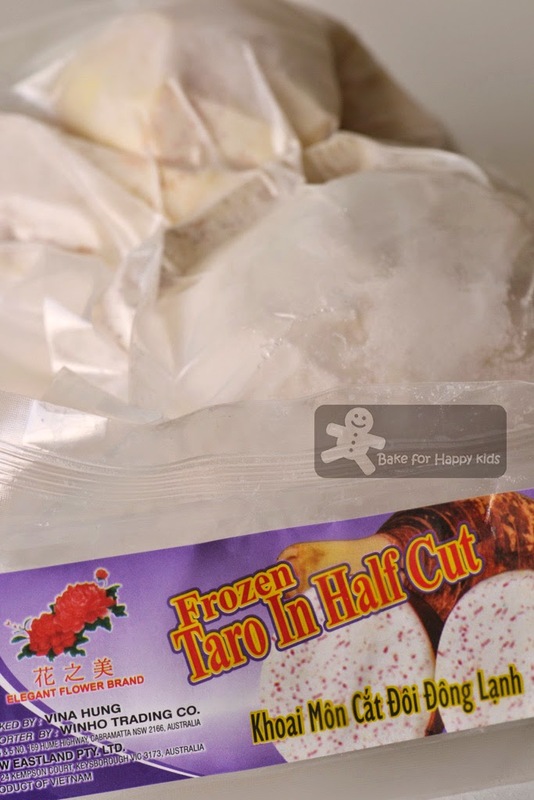 Wrap custard in cling wrap and chill it in refrigerator until required. Among a few great flaky yam mooncake recipe, I have decided to use this pastry recipe because 1) the one from Anncoo Journal uses slightly more fat content that this but I love to use Ann's thorough step-by-step mooncake shaping instruction as my reference to shape my mooncakes. She is always so brilliant! 2) the very well shaped mooncakes from Nasi Lemak Lover uses ghee. I know that Sonia's mooncakes are prettier but for health and personal reasons, I like to restrict myself to use of Crisco shortening with less saturated fat. I reckon both Ann's, Sonia's and my recipes all make nice and flaky pastry. Which is better? I don't know and I guess the choice is really up to each individual. To make the water dough, combine warm water, vinegar and purple colouring. Dissolve sugar in the vinegar mixture. Rub in shortening into high protein flour, add the vinegar mixture gradually. Combine and knead into a dough. Allow dough to rest in the fridge for at least an hour, then divide into 6 portions. To make the shortening dough, steam all-purpose flour and sieve when it is completely cool. Add shortening into the flour and knead to form a smooth dough. 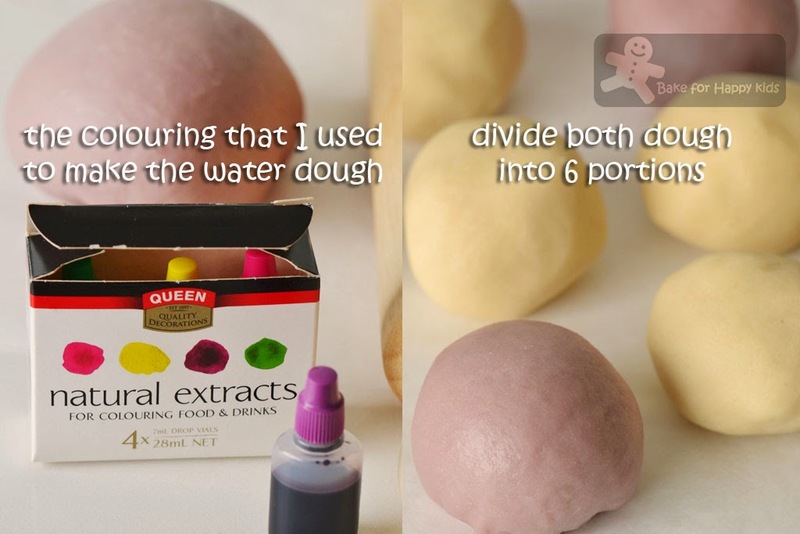 Allow dough to rest in the fridge for at least an hour, then divide into 6 portions. Line baking trays with baking paper. Preheat oven at at 200°C or 180°C fan forced. With reference to my picture, wrap one portion of shortening dough inside one portion of water dough. 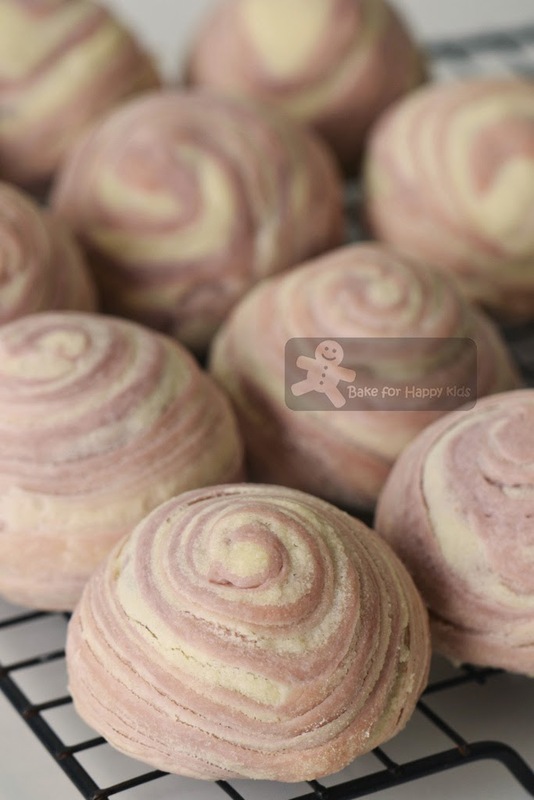 Using a rolling pin, roll out the dough into an oval shape, then roll it tightly like a Swiss roll. 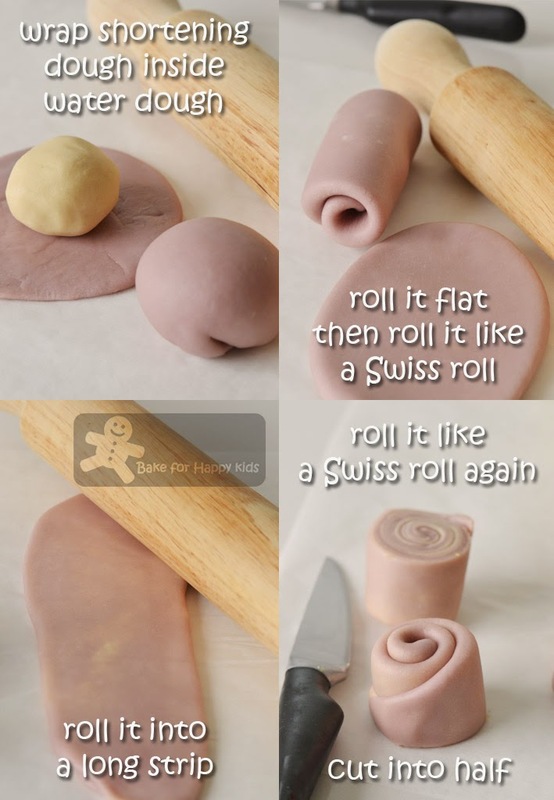 Using a rolling pin, roll the dough out into long strip and roll it tightly again like a Swiss roll. Using a knife, cut the rolled up dough into half. Repeat the same with the rest of the 5 portions of water and shortening dough. 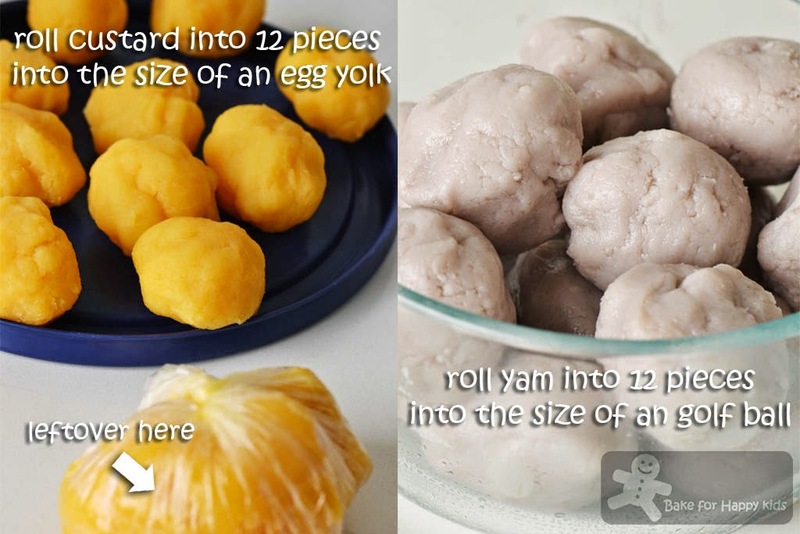 Meanwhile, divide yam filling into 12-14 portions in the size of a golf ball. 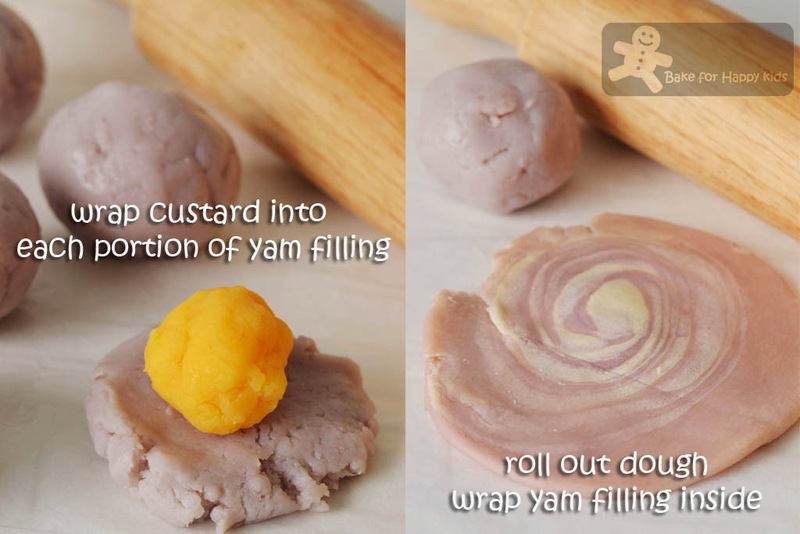 Roll out custard filling into 12 portions in the size of an egg yolk and wrap each into each portion of the yam paste. Place each portion of yam filling in the middle of each rolled out pastry. Wrap filling inside the pastry. Seal the end. Arrange shaped mooncakes on prepared tray and bake for 20 min or until pastry look firm and cooked. Allow mooncakes to cool on the tray slightly for 5 mins, then remove to racks to cool completely. Serve when they are completely cooled or chilled in the fridge. Storage: As these mooncakes are made with reduced amount of sugar, they should be stored at room temperature only up to 3 days and can last up to 2 weeks if they are stored in the fridge. the first word on your taro pic was wow... and then came a second wow after i see the mysterious zoe after a long long time! this has been something i wanted to make for years but the taro is making me too lazy.. hahahaha. will you care to ship? Zoe I think you're pretty amazing :) They look identical to the ones I've had in TW and you've inspired me to give it a try soon! wow wow love the swirls zoe and i searching for this recipe,can we steam it instead baking? You can't steam this pastry. It will become soggy. Wow, you are brilliant. 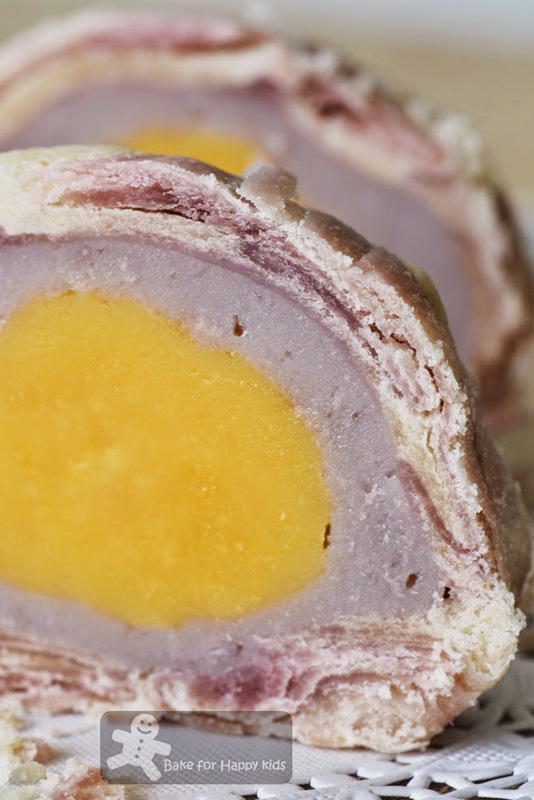 I really like your idea in replacing the egg yolk with custard filling. Its so woooow..!!! Mooncakes are just so amazing!! Love the custard filling and the rolls! !1 Visual Treat!!! I gotta break my own rules and comment on your post today (I mentioned that I won't be commenting in the meantime).. First, I love yam mooncakes.. And not to mention flaky pastry yam mooncakes, yummzzz.. And secondly, OMG, finally I see your face! You look like one hot bombastic mama, baby! Zoe, you are so clever! Your pastry is really flaky and I love the contrasting colours. I bet these yam mooncakes are very delicious and were finished up in no time! One word...AWESOME! These mooncakes are another of my favourites! Zoe, I love flaky pastry like you too, your thousand layers taro mooncakes look awesomely delicious, wish I could sink my teeth into the screen to taste it! Wow! I didn't know this kind of food before reading your post! Thanks for sharing your lovely moon cake with Best Recipes ,Cheers! They look cute :) there are so many delicious things that I have never tried.. This is my favorite and you make yours in custard filling. I love, love ,love your version. Hi Zoe, I made this Taro mooncakes few years back before so I know how delicious it is!! Come to your blog and for the first time I "see" your face. I am so glad to have stumbled by - these mooncakes are gorgeous and sound so incredible! Wow i tried my hands with moon cake, this looks fabulous;. Your moon cakes are gorgeous! I've never tried them before, but they sound wonderful. So pretty. so so pretty. love the colours and the swirls! Wow! Zoe. This is so well done! These are so beautiful and it's amazing that you know how to make these at home! Imagine all the money most families would save if they knew how to make more traditional pastries and desserts at home! Love the taro filling I'm a huge fan! Wow! Looks flaky! Your family is very lucky to have homemade mooncakes! Replacing the egg yolk with custard is a brilliant idea indeed. I am not making any, (bad mommy! ), as I am not a fan of mooncakes. I've made mooncakes before, but ever since my wooden mould was lost by someone several years ago, I have stopped making any. But I'm impressed with all the different types and varieties that everyone has made in bloggerland! Mooncakes are extremely costly nowadays! I think they are rather over-priced! Homemade is cheaper and healthier, thumbs up! Simply amazing! That's a lot of work and effort there, but I'm sure it was well worth it! Your post and the food you make reflects how passionate you are about your food and blog. :D Great work! I made this pastry before, it was pretty and nice. 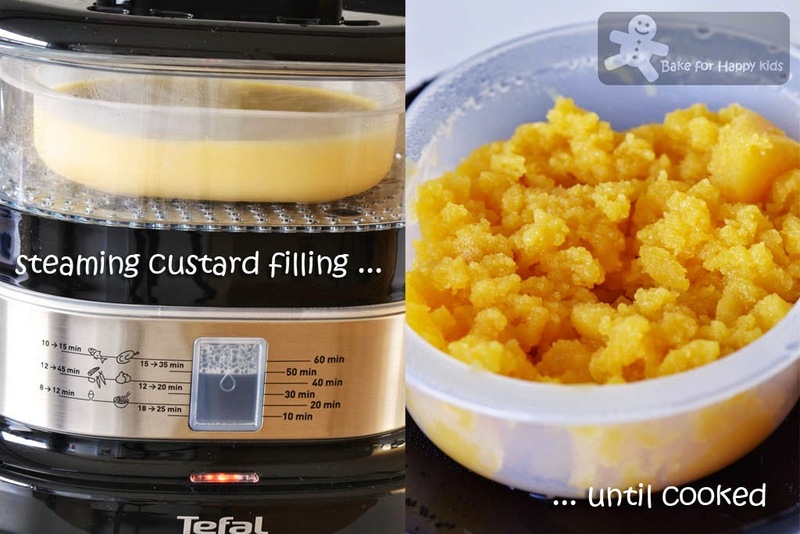 I love the idea of having custard filling, personally I don't like salty-egg yolk in sweet food, custard is a great substitute! These pastries look so yummy. I like them but I find them more time consuming to make compared to the traditional baked ones. Thumbs up! Hello Zoe! I must have missed out a lot of recipes here! First of all and finally, I get to see you! Yeah, the picture of you, hahaha! So this is how Zoe look like, no more blur blur shot behind the balloon whisk, oh, was it a whisk before, can't remember, hehe! 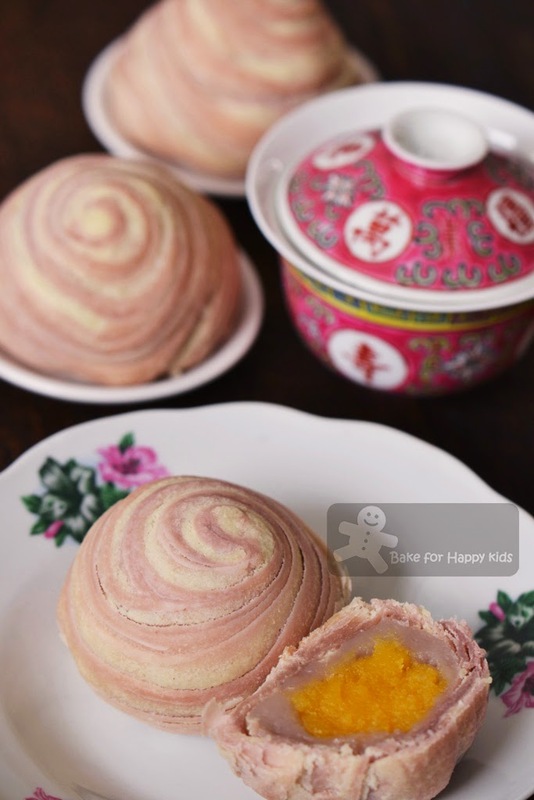 These thousand-layer flaky swirl mooncake look soooooo good! I like the clean cut after they had been refrigerated! This must be so tasty. Looking at the recipe, yoh, it would be good if I can find a baking buddy to do this with me, can chat along during making, then the whole job won't seem like too tedious to handle. Happy Mid-autumn festival in advance to you & your family! To make the shortening dough, steam all-purpose flour and sieve when it is completely cool. Are you mistaken ?We cannot steam AP flour and then sieve it which is all wet. Yes that I did steamed my all purpose flour and managed to sieve it when it is completely cooled. I know that this steaming step can be totally optional but steaming does help to soften the flour and eventually give the dough a smoother texture. I guess that you must have steamed your flour with too much heating, thus causing your flour to be wet. Nevertheless, it is totally up to you if you want to steam the flour or not. Cheers! What type of high protein flour you used? Bread flour? Can I use all purpose flour? Hi, High protein is also bread flour contains more than 10% protein, preferably 12% protein content. You can use all purpose flour but it won't be as stretchy and firm as the dough that is made with bread flour.